Has China, in fact, sought to restrict the freedom of navigation interest? Recently, a former officer in the People’s Liberation Army (PLA) of China published a commentary, entitled 5 Myths About China’s Missile Deployment on Woody Island. Among those five myths was one about China and the freedom of navigation in the South China Sea. Such Chinese comments and others like them made by officials of China’s government, share a common theme: Any international concern about China’s actions in the South China and their impact on the freedom of navigation is much ado about nothing. Using the methodology similar to the one followed in scientific community and the popular television show Mythbusters, this author is undertaking a close examination of the Chinese myth about the freedom of navigation in the South China Sea (hereinafter, the “FON myth”). That analysis attempts to test the FON myth in a three-step manner, by: (1) identifying the applicable universal standards, (2) correcting inherent fallacies in the myth, and (3) applying those standards to relevant data. Steps 1 and 2 were discussed in a previous commentary, which is summarized below. Step 3 will be the focus of this second commentary on the matter. The previous commentary identified a number of fallacies about the FON myth. They included the following: (a) the freedom of navigation is comprised of only one particular navigational right, not a set of them; (b) the freedom of navigation is something that guaranteed to only “civilian and commercial” vessels; (c) the prohibited threshold to which a coastal state may not limit the freedom of navigation enjoyed by other states is “sabotage”; and (d) the only activities of a coastal state that are subject to questioning for improperly limiting the freedom of navigation are those conducted by the coastal state’s military forces. Each of those fallacies was corrected with a discussion of the applicable concepts and rules of international law, derived primarily from the U.N. Convention on the Law of the Sea (UNCLOS). In its conclusion, the previous commentary refined the original FON myth to properly reflect the concepts and rules of international law, which resulted in the following: No organ of China’s government has taken action to deny or impair any of the rights, freedoms, or lawful uses of the sea and airspace of other states in the South China Sea; China’s laws and regulations are in full conformity with provisions of UNCLOS and are not incompatible with any other rules of international law. That refined FON myth will be the starting point for the follow-on analysis. STEP 3: Testing the FON Myth with the existing record of evidence. Data Point A: China draws straight baselines along its entire mainland coast. China has employed the straight-baseline method of drawing baselines along its entire coastline, thereby claiming the resulting – very extensive – enclosed waters as internal waters that are off limits to all ships of other states. But this is an excessive maritime claim under international law. Specifically, Article 5 of UNCLOS states clearly that the “normal” method for states to draw baselines is the low-water line along its coastline. And the International Court of Justice has ruled that the straight-baseline method was intended to be an “exception to the normal rules” and “must be applied restrictively.” It is difficult to believe that the entire mainland coast of China, including those portions adjacent to the South China Sea, happens to satisfy the requirements of international law for the exceptional method of drawing straight baselines. Data Point B: China draws straight baselines around two if its claimed off-shore island groups. But this is also an excessive maritime claim under international law. Specifically, Article 47 of UNCLOS recognizes the right to draw archipelagic baselines (i.e., baselines around the group of islands), but recognize that right only for archipelagic states. And China clearly does not meet the Article 46 definition of an archipelagic state, as it is not a state composed “wholly” of islands. Data Point C: China requires foreign warships to obtain authorization prior to innocent passage. China requires foreign military ships to obtain permission from it prior to exercising the right of innocent passage through its territorial sea, and legislates that only “non-military foreign ships enjoy the right of innocent passage” through its territorial sea. Once again, this is an excessive maritime claim under international law. The right of innocent passage is guaranteed to all ships, including warships. And Article 24 of UNCLOS prohibits a coastal state from “impos[ing] requirements on foreign ships which have the practical effect of denying or impairing the right of innocent passage.” Requiring all foreign warships to obtain prior permission from the coastal state most surely has the practical effect of impairing the right of innocent passage. Data Point D: China asserts security jurisdiction in its contiguous zone. China asserts that it may control “security” in its contiguous zone. But this is also an excessive maritime claim under international law. Article 33 of UNCLOS allows a coastal state to enforce only four categories of national laws and regulations within its contiguous zone: fiscal, immigration, sanitation, and customs laws. However, China has added a fifth category of “security” jurisdiction in its contiguous zone, a subjectively elastic category that restricts the freedom of navigation. Data Point E: China opposes foreign military activities in its exclusive economic zone. China has repeatedly opposed foreign military activities in and over its EEZ and characterized those activities as violating international law. Data Point F: China asserts jurisdiction for fisheries enforcement in most of the South China Sea. 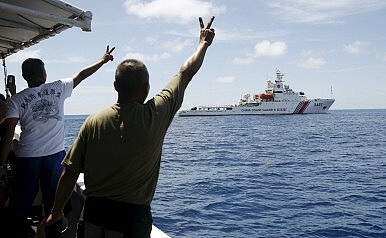 China has declared annual fishing bans that cover significant portions of the South China Sea. In all of the waters covered by these unilateral fishing bans, China purportedly requires all foreign fishing vessels to obtain permission from China, and authorizes the seizure of vessels and catches for those failing to obtain China’s permission. But these fishing bans are an excessive maritime claim in international law. Article 56 of UNCLOS recognizes that a coastal state may regulate fishing within its EEZ, the breadth of which may not exceed 200 nautical miles as measured from its coastline. However, China’s fishing bans in the South China Sea apply to waters greater than 200 nautical miles from any of China’s undisputed coastline (i.e. its mainland and Hainan Island), waters greater than 200 nautical miles from any disputed islands in the Paracels or Spratlys, and even waters within 200 nautical miles of the mainland coasts of its neighbors Vietnam and the Philippines. Data Point G: China’s military has taken action to deny or impair freedom of navigation. In May 2015, audio recordings were released showing how PLA forces repeatedly warned U.S. military aircrafts to “go away” and depart an undefined “military alert zone” in the international airspace of the South China Sea. In February 2016, Australia’s Chief of the Air Force publicly stated that PLA forces are also challenging nearly every Australian military aircraft that operates lawfully over the South China Sea. In November 2013, China’s Ministry of National Defense established an air defense identification zone (ADIZ) over significant portions of the East China Sea, which applied to all aircraft located in the ADIZ, including foreign aircraft transiting portions of that ADIZ in international airspace without any intent to enter China’s national airspace. As this author has previously discussed, such an overbroad ADIZ rendered it excessive under international law and jeopardized the freedom of navigation interest of all other states. Although this particular action by China’s military did not apply to the South China Sea, prior action is often one of the best indicators of future behavior. Given recent reports of China deploying surface-to-air missiles in the Paracels and emplacing radar systems in the Spratlys, many observers are understandably asking whether the world is witnessing the preliminary phase of China’s military declaring another overbroad ADIZ in the South China Sea. And this does not include the actions by China’s naval militia (i.e., fishing vessels as government proxies) to impede the freedom of navigation in the South China Sea. The eight data points outlined above provide compelling evidence for testing the FON myth. Together, they demonstrate that China has, in fact, attempted to restrict the freedom of navigation interest (i.e., the rights, freedoms, and lawful uses of the sea and airspace) in the waters of the South China Sea, which international law guarantees to all states. One overarching comment about these data points must be emphasized. Admittedly, a number of coastal states elsewhere in the world have enacted national maritime claims that might be similar to one or more of those of China that are discussed above. What is important to recognize is that most of those states only have one or two maritime claims that are excessive in relation to international law. By contrast, China is one of only seven coastal states in the entire world that has enacted a “full house” of excessive maritime claims affecting the freedom of navigation interest guaranteed to all states in each of the maritime zones adjacent to its coastline (i.e., internal waters, territorial sea, contiguous zone, EEZ, high seas). Thus, in analyzing the FON myth that Jin and other Chinese voices seek to propagate, the evidence outlined above supports only one logical conclusion: China’s FON myth for the South China Sea is “busted.” In other words, the international community has legitimate grounds to be concerned about China’s actions impacting the rights, freedoms, and lawful uses of the sea and airspace in the South China Sea. Commander Jonathan G. Odom is a judge advocate (i.e., licensed attorney) in the U.S. Navy. Currently, he serves as a Professor of Law at the Daniel K. Inouye Asia-Pacific Center for Security Studies. From 2012 to August 2015, he served as the Oceans Policy Advisor in the Office of the Secretary of Defense. The views expressed are his own and do not necessarily reflect the positions of the U.S. Department of Defense or any of its components. He may be contacted at [email protected]. Understanding law and politics in contested waters.